Season 8, Episode 16 - "Danny Doubles Down"
Season 8, Episode 15 - "Red, Hot, and Dangerous"
Danny has big plans for a little street rocket known as a Manta, and the crew commissions an 80s era Corvette that the owner wants to bring into the new millennium. Shannon meets a lady motorcycle racer who wants her Harley XR1200 customized to her exact specifications. Season 8, Episode 14 - "Counts of Hazzard"
Guitarist DJ Ashba stops by the shop to have Danny work on his 100 year old Model-T rat rod. Then, the Count's Kustoms crew are commissioned to build a car that would make Bo and Luke proud, a 21st century version of the iconic General Lee Dodge Charger from the "Dukes of Hazzard" TV show. And when the proud owners of a 1996 Ford Bronco want to pay tribute to their military family with a portrait on the hood, they enlist Danny to get the job done. Season 8, Episode 13 - "Burt Reynolds' Rides"
Vegas Golden Knights goalie Marc-Andr Fleury comes to Count's Kustoms looking for an All-American muscle car fit for a three-time Stanley Cup champion. Plus, Danny agrees to prep several of Burt Reynold's personal rides for auction, he didn't know that he would be fulfilling one of the film legend's final wishes. Season 8, Episode 12 - "Heavy Metal Caddy"
Brann Dailor, drummer for the Grammy winning heavy metal band Mastodon, brings in his 1970 Cadillac Coupe DeVille for some much needed Counts Kustoms love. Shannon and Ryan bring in a one-of-a-kind motorcycle, owned by a one-of-a-kind lady. Plus... Kevin comes across a 1972 Boat Tail Riviera that he's pretty sure Danny will fall in love with. Season 8, Episode 11 - "Big Truck Custom Combo"
Danny is commissioned to custom paint a brand new pick-up for a charity auction for the local YMCA. But Danny can't stop at paint, he adds the ultimate accessory, a matching chopper that fits in the back. With time running short, Ryan needs everyone working at lightning speed to complete both. Between projects, Kevin and Ryan spot an awesome 1953 Chevy Lowrider, and pull it over for closer inspection. Season 8, Episode 10 - "Champion Chopper"
When the World Series of Poker guys want a Count's Kustoms chopper as the ultimate online giveaway, Danny is determined to make it something special, without looking like a billboard. Meanwhile, Mike and Ryan check out a completely original 1967 Camaro SS and go for a spin in a 1957 Bel Air. Then Danny and Ryan come across something really unusual - a 1969 Checker Aerobus. Season 8, Episode 9 - "Low Riding Lincoln"
Danny and Ryan have big plans for a low riding Lincoln. Lonnie, one of the shop's long time painters, wants to give his Lincoln lowrider a new, but simple, paint job but that's not going to happen. While Lonnie tricks out the inside, Ryan uses some insane painting techniques to give it the full Count's Kustoms treatment. Meanwhile, Mike and Paul find a Rolls Royce that used to belong to Donny and Marie Osmond. Then Mike and Ryan check out a super rare all original '69 Mach 1 Mustang. Season 8, Episode 8 - "Milk Truck Masterpiece"
Season 8, Episode 7 - "Cadillac Crazy"
Steve's family has owned the same 1966 Caddy Convertible since he was five. He and his wife even took it to their prom! Now he commissions Danny and the team to restore it back to its glory days. But a tight budget turns this project into a real challenge. Meanwhile Ryan and Mike are hunting for a flip and spot a rare 1964 Buick Skylark. Season 8, Episode 6 - "Burning Hot Nova"
Danny and the team are commissioned to turn a 1969 Chevy Nova into a dream machine. The budget is big but not big enough. But once Danny commits, he's all in and decides to do whatever it takes to make this one of the world's baddest Novas. While the car spends countless hours in the body shop, Ryan and Mike find a '73 Cougar convertible said to belong to Hollywood Royalty. Later, Ryan and Kevin go on the hunt and stumble upon a rare 1952 British motorcycle. Season 8, Episode 5 - "Dad's T-Bird"
Danny finally gets around to tackling one of his most important projects, restoring his father's 1956 Ford Thunderbird. Next Danny spots a gorgeous El Camino with a sky-high price tag. But Mike and Shannon pull the trigger on an overpriced old jeep, making Danny very unhappy. Season 8, Episode 4 - "4 Star Corvette"
A retired four-star general has an important mission for Danny and Counts Kustoms: to build his dream car, a 1967 Chevy Corvette. Danny knows this is one of the most important cars the shop has ever done and goes all out to impress the brass. Next Danny buys a down on its luck classic Jaguar. While Horny Mike puts the finishing touches on his massive Horny Truck and Trailer. Season 8, Episode 3 - "Space Racer"
Counts Kustoms gets an out of this world request for a '57 Chevy to be customized with images from the Hubble Telescope; Horny Mike convinces Danny to help him customize a giant truck and trailer, and Danny soon regrets his decision. Also, while Danny and Ryan are hunting for a possible flip, they spot an incredibly rare and valuable Shelby Mustang. Season 8, Episode 2 - "Bye Bye Baby"
Season 8, Episode 1 - "Dream Charger"
Danny decides to sell some of his most beloved cars. But the Count does not have a great track record when it comes to parting with his "babies," so the guys in the shop are understandably skeptical. A customer asks Danny to find and build the first car he ever had, a 1968 Dodge Charger. Plus Ryan and Shannon are tasked with recreating one of the most iconic motorcycles of all time–the "Captain America" chopper from the classic film, "Easy Rider". Season 7, Episode 19 - "Old School Camaro"
When a high rolling client gives Danny free rein to put the Count's Kustoms spin on a muscle car of his choice, The Count goes old school with 1967 Camaro. This car is beautiful right from the start enabling Danny and the team to focus on turning it into a world class street machine. Meanwhile, Mike and Shannon find a rare 1968 Barracuda. Season 7, Episode 18 - "Naughty Nomad"
When a client rolls into Count's Kustoms with a beautiful 1955 Chevy Nomad, Danny can't help but want the car for his collection. While the owner wants a simple paint job Danny and Ryan have a hard time doing simple. They take a chance and decide to surprise the client with some Count's Kustoms style pin striping. Danny figures the Nomad's owner doesn't like how it turns out, he might just sell it! Meanwhile, Mike and Shannon find 1972 Nova in desperate need of an overhaul. Then Ryan and Shannon check out a rare Harley-Davidson dirt bike. Season 7, Episode 17 - "Bonneville Bound Part 2"
Ryan and Kevin head to the Bonneville Salt Flats to see The Turbinator, a vehicle that holds a land speed record try to break 500 MPH. Back at the shop, Davey Deals stops by to ask Danny to help him sell a classic 1951 Nash, and Mike and Paul trick out an electric bicycle that's projected to hit 100-miles-per-hour. Danny decides to put the bike to the test, pitting two wheels of electric power against the high octane horsepower of an all American Muscle car. Season 7, Episode 16 - "Bonneville Bound Part 1"
When the vehicle holding a land speed record, The Turbinator, blew a tire at 400 MPH last year, some serious damage was done. Now that it's repaired and ready for an awesome paint job, the owners have called on Counts Kustoms to make the vehicle look as fast as it goes. Danny decides that the crew should be there in Bonneville, Utah when the Turbinator goes for the record again. Shannon and Mike have to work through a communication snafu to complete a cool paint job on an Indian Motorcycle, and Danny checks out a classic Mercury and a Rolls Royce. Season 7, Episode 15 - "Bel Air Beauty"
A client wants a 1956 Chevy Bel Air, not just to remember the old days, but to drive cross country. Danny finds a red beauty, and he and the crew jump in to make her look like 1956, but drive like today. Ryan and Mike drive to a local shop to check out another classic Chevy–a fully restored 1960 Corvette. Kevin and Mike are on the hunt for a new flip and spot a rare 1963 Mercury Comet. Season 7, Episode 14 - "Storm Chaser"
The local Fox News channel is looking to update their Ford Expedition Storm Chaser in the coolest way possible. They want to turn a run-of-the-mill SUV into an all-weather mobile news unit they can also bring to schools to help kids learn about weather. The elaborate paint scheme calls for all the iconic Vegas attractions and the station's mascot, Rusty the Fox. Meanwhile, Danny and Ryan get a class in high performance driving at the Bondurant Racing School in Phoenix. And later Kevin and Roli find a rare 1956 Ford Truck with a history as outrageous as its price tag. Season 7, Episode 13 - "Get Your Motor Running"
Danny and Shannon are in motorcycle heaven when they are asked to restore a rare 1957 Harley Davidson Pan head prototype. This historic motorcycle has spent 20 years in the client's living room but now it's time to once again get its motor running. While Shannon's busy returning this motorcycle to its former glory, Danny checks out some rare old cars, including a Model A Ford, a French Citroen, and a 67 Firebird. Season 7, Episode 12 - "Oh My Nova"
Danny and the guys help a customer surprise his brother on his 50th birthday with an amazing gift, a muscled up fully restored '68 Chevy Nova. Danny's friend Mike swings by with a classic Mercury while Ryan and Shannon hit the streets and find a guy and his car that are true Vegas originals. Season 7, Episode 11 - "The Amazing Z"
It seems every time Danny finds a project for the shop, he winds up keeping it. Now Ryan and Kevin are determined to find a car Danny will actually fix up, and flip. And they do, a 1972 Datsun 240z. Danny agrees to fix it and sell it, but when he has a last minute change of heart, Ryan has to figure out how to make the Count's vision a reality without derailing the whole project. Meanwhile, Davey Deals shows off his new muscle car, a 1969 Falcon, and Ryan and Kevin spot and pull over a restored 1953 Ford. Season 7, Episode 10 - "CHiPs Bike"
Kevin's brother Steve wants a 1980 Kawasaki KZ100 motorcycle tricked out just like the ones on the classic TV series, CHiPs. He and Danny try to keep the project a secret, but Kevin finds out and plans a surprise of his own, and no one can believe who rides the bike out in the end! Ryan and Mike pull over a 1961 Ford Falcon that's built for the dragstrip, and Danny sets his sights on a classic Grand Prix that he thinks will make a perfect flip for the shop. Season 7, Episode 9 - "Mustang Madness"
In this special episode, Reservoir Dogs star Michael Madsen asks Danny and the Counts Kustoms crew to restore a 1964 Mustang as a special surprise for his son. Meanwhile Danny transforms a classic El Camino into a high tech video gaming street machine. And if all this wasn't enough, Danny investigates a 1936 Auburn that could be worth six figures. Plus a plain jane bicycle gets the ultimate Counts Kustom's makeover. Season 7, Episode 8 - "Dee's Sweet Ride"
Twisted Sister's Dee Snider brings Danny and the gang a brand new BMW Z4 that he wants Count-ified for his wife Suzette as an anniversary present. A simple paint job turns disaster when Suzette is not happy with the finished product, not once, but twice. Meanwhile, Mike aims to make lunch hour special by building a picnic table on wheels that is as insane as it is functional. Season 7, Episode 7 - "Mighty Fine '69"
When Danny gets a commission to restore a 1969 Corvette, his biggest challenge won't be bringing her back to life but rather not letting her go when he's done because this is his absolute dream car. Meanwhile, Kevin and Mike check out two classics that have been hidden in a garage for decades, and later Mike finds a rare Oldsmobile 422 that he can't wait to show Danny. Season 7, Episode 6 - "The Fast and the Ridiculous Part 2"
The guys finally find a not so perfect car for the Arizona Lemons race; a beat up old racer, once owned by Shannon. With a little begging and very little cash they buy it back. Next they resurrect the Junker as the "Counts Bloody Mess." Now ready to race they realize first place may not be an option but maybe they can get the "Counts Bloody Mess" to at least finish in one piece. Meanwhile, Ryan and Danny get a lead on a car rumored to have been customized by the legendary creator of the Batmobile, George Barris. Season 7, Episode 5 - "The Fast and the Ridiculous Part 1"
Mike and Shannon convince Danny to sponsor them in a 24-hour endurance race called The LeMons, which pits cheap hunks of junk against each other in the Arizona desert; the guys must find the perfect pile of rolling rust for the race. Season 7, Episode 4 - "Hot Rod Lincoln"
Kevin tries to get Danny to sell some of his cars, but succeeds only in kick starting another of Danny's dream builds, a 1970 Lincoln Mark III. Meanwhile, NASCAR star Kyle Larson stops by the shop to check out some of Danny's hottest rides, and hooks Danny and the guys up with the VIP treatment for a NASCAR race at the Las Vegas Speedway. Season 7, Episode 3 - "Tommy Lee's Chopper"
When Tommy Lee's beloved bike gets crushed in an accident, he turns to the only person he trusts to fix it–the guys who built it–Count's Kustoms. Danny and Ryan take in a cool collection to cheer them up after seeing Tommy's smashed bike. Then after lots of tender loving care, Danny heads to LA, to bring Tommy his baby back. Season 6, Episode 26 - "Danny's New Truck"
Season 7, Episode 2 - "Patriotic Chopper"
Danny and the team are commissioned to build a bike for a true American hero, a military veteran. He wants to show off his love for family and country by covering the bike with American flags, and portraits of loved ones who also served. Mike and Ryan are up for the challenge and battle it out to see who can paint the most glorious Old Glory. For a little patriotic inspiration, Danny and Ryan check out an incredible collection of American muscle cars while Mike and Shannon find a car so rare, they have no idea what it is. Season 6, Episode 25 - "Patriotic Chopper"
Season 7, Episode 1 - "Danny's New Truck"
Danny charges Ryan with customizing his new Chevy Silverado; Danny wants it to maintain the flavor of his old 1956 truck; Danny and his friend, Davey Deals, find a rare GTO Judge; Mike buys a 1969 Corvette that may be a rip-off. Season 6, Episode 24 - "Better Late Than Never"
Shannon recruits the guys to help him finish up a gift for Danny, a bike he started building for him 10 years ago; Danny spots a 1969 Corvette in a friend's lot and can't resist paying a visit. Ryan buys a sweet Baja Bug. Season 6, Episode 23 - "Crazy Cool Cadillac"
Ryan goes down the Cadillac customization wormhole, and everyone is happy to watch him go, just to see how the project turns out; Danny is inspired to go check out an amazing Cadillac collection; Mike and Paulie try to buy a rare old Camaro. Season 6, Episode 22 - "'68 Killer Camaro"
A high-end client has his heart set on a tricked-out '68 Camaro, so Danny sets out to find one and give it the world-class Counts Kustoms treatment; Kevin spots a 1969 AMX that he knows Danny has always wanted. Season 6, Episode 21 - "Big Money Bike"
Danny builds a world-class bike for a high-end client, and if all goes well it could mean a ton of new business for the shop; Mike and Ryan hunt for the perfect Mustang and Kevin spots a car his grandmother used to drive. Season 6, Episode 20 - "Tricked Out Triumph Part 2"
Danny and his crew continue to piece together a World War II-era Triumph motorcycle for a client, hoping to make it a tribute to his family's military roots, but when they finally get it all together and try to crank it, it won't start. Season 6, Episode 19 - "Tricked Out Triumph Part 1"
The team is commissioned to restore a 1941 Triumph motorcycle back to its World War II-era glory; even with a ,000 budget, the project turns into a big challenge; Danny tricks out a friend's Denali and visits a mind-blowing car collection. Season 6, Episode 18 - "Mangled Mustang, Part 2"
Danny and the team continue wrestling with a stock restoration Mustang mess, hoping for extra funds and a lot of patience from their client; Kevin spots a rare old Grand Prix and Danny visits a world class specialist, looking for ideas. Season 6, Episode 17 - "Mangled Mustang, Part 1"
Danny must do a full bumper-to-bumper restoration on a '66 Mustang convertible, but after stripping it down, he finds very little car between her bumpers; Danny must to decide between asking for more money or losing a bunch of his own. Season 6, Episode 16 - "Chevy Truck Tribute"
A family brings in an old pickup truck to be restored in memory of their mom, and Danny needs to figure out how to build the perfect tribute vehicle, without blowing the budget. Later on, he finds a rare old Oldsmobile 442 that the owner is looking to sell before he moves out of town. Danny sleeps on it, and goes back for another visit, determined to score that Olds. Season 6, Episode 15 - "Superfine Econoline"
Danny makes an old Ford Econoline look so cool that in the end, two buyers get into a bidding war for it. Danny can score big, but only if he can let his baby go. Also, Mike and Roli find a BMW motorcycle with a lot of history, and then stumble upon Mike's dream car in a local's garage. Season 6, Episode 14 - "The Cart of War"
Danny loses his cool when he sees his golf cart covered in dirt and Horny Mike's stuff; Kevin tries to make Danny happy and teaches Mike a lesson. Season 6, Episode 13 - "Sailor's Soul"
Sailor Jerry representatives enlist the guys to build a bike commemorating the late tattoo artist's iconic style and to auction it off at a charity fundraiser; Danny decides it's time for Mike and Ryan to improve their body art. Season 6, Episode 12 - "True Fire Fiasco"
Season 6, Episode 11 - "70's Scoot"
Season 6, Episode 10 - "Back in Time"
Season 6, Episode 9 - "Twisted Chopper"
Season 6, Episode 8 - "Blinged Out Blazer"
Season 6, Episode 7 - "Lego My Caddy"
Season 6, Episode 6 - "Caddylicious"
Season 6, Episode 5 - "Boogie Down Buggy"
Season 6, Episode 4 - "Snider's Ride"
Season 6, Episode 3 - "El Camino Royale"
Season 6, Episode 2 - "Pick Ups and Ponies"
Danny plans to tackle a 1971 Chevy C10 Pick Up and flip it for big bucks, but a problem in the paint department threatens to blow the budget. Later, Danny's bandmate gets in a fender bender. Season 6, Episode 1 - "Sweet Lambo of Mine"
Former Guns 'n Roses guitarist DJ Ashba wants his 2004 Lamborghini Murcielago turned into the ultimate "mancar," and Danny plans something special for DJ's wife. Meanwhile, Ryan and Paulie find a classic Corvette that looks great on the outside, but is a mess on the inside. Season 5, Episode 18 - "Craziest Rides: Superfly"
Season 5, Episode 17 - "Craziest Rides: '70s Dune Buggy"
Season 5, Episode 16 - "Craziest Rides: Buick Riviera"
Season 5, Episode 15 - "Craziest Rides: Supercharged Roadster"
Season 5, Episode 14 - "One Of A Kind Commissions"
Think outside the box with the Count's Kustoms crew and revisit some of the most unique projects ever commissioned on Counting Cars: a '72 Chevy Blazer transformed into a tailgaters' dream, a chopper specially customized for an amputee rider, a run-down Ford Ranchero converted into a billiard beauty, and a long lost '69 Pontiac Firebird brought back from the dead. Later, Rick Harrison challenges Danny to turn a rust bucket into a replica of the Mustang featured in the Steve McQueen classic Bullitt. Season 5, Episode 13 - "Perfect Paint"
Paint the town with Danny and his crew and revisit some of the most impressive paint jobs in Counting Cars history: a 1971 Road Runner gets a crazy new coat to commemorate a loved one, Rob Zombie's truck undergoes a screaming transformation, a Harley is transformed into a work of art inspired by the client's own tattoos, a dune buggy gets a nautical-themed electric blue makeover, a horse trailer is given a traffic-stopping new look, and a champion soap box racer receives a red hot finish that's bound to intimidate the competition. Season 5, Episode 12 - "Rung It Like You Brung It"
Mike gives all the guys their own drifter trikes, but they have to customize them, then race them at the local track; Danny finds a property full of funeral cars, he finds himself in hearse heaven. Season 5, Episode 11 - "Colorful Customers"
Danny looks at some of the most famous clients to walk through the doors at Count's Kustoms; Elvira, who needs a facelift for her infamous Macabre Mobile; Chumlee and the Lincoln Continental he wants to flip in true ``Pawn Stars'' fashion. Season 5, Episode 10 - "Swap Meet Mayhem"
Season 5, Episode 9 - "True Classics"
Season 5, Episode 8 - "Carl's Corvette"
Season 5, Episode 7 - "Outrageous Automobiles"
Season 5, Episode 6 - "Finders Keepers"
Season 5, Episode 5 - "Highways and Driveways"
Season 5, Episode 4 - "Harley and the Mystery Merc"
Danny makes a plan to put the Count's Kustoms touch on a classic Harley Davidson that he hopes to sell for a big profit. But when the bike reaches Horny Mike the whole project is put in jeopardy. Meanwhile Danny finds a rare Mercury that he knows nothing about, but he loves it so much that he starts bidding anyway. Season 5, Episode 3 - "One Sweet 'Stang"
Danny scores a 1967 Mustang that he hopes he can turn into another Count's Kustoms masterpiece. He visits a local muscle car collection for inspiration, and later brings in an expert from the Shelby headquarters for a seal of approval. But will The Count's Mustang cut the mustard? Also, Shannon and Roli meet a classic couple and their classic 50s Chevys. Season 5, Episode 2 - "Chrome Is Where the Heart Is"
Danny tries to get the derailed '62 Caddy project back on track, while Ryan tries to make amends for a mishap by finding a flip or two for the shop. When Danny finally unveils his finished 62 Caddy, will Ryan's paint plan make it all worth the trouble, or will this Caddy be one big expensive mess? Season 5, Episode 1 - "Who's Your Caddy?" Danny acquires a '62 Caddy which he hopes will be a huge flip. Ryan devises a secret plan for the car behind Danny's back, but when Danny finds out there's some explaining to do. Later, Danny and Ryan visit a world-class dune buggy collection, while back at the shop a snafu threatens to turn the Caddy from a money maker, into a money pit. 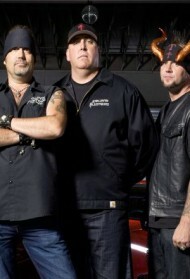 Season 4, Episode 34 - "Paint Jobs"
Brush up with Danny and his crew and revisit some of the best paint jobs in Counting Cars history: a constitutional Corvette that blows its new owner away, a 1960 Chevy Delivery that's been through three paint jobs, a '92 Ford ambulance converted into a spooky ghost-hunting machine, a patriotic motorcycle that pays tribute to the USS Belknap, and a '59 Chevy Panel Truck that leaves Danny speechless. Season 4, Episode 33 - "Flamin' and Misbehavin'"
Danny wants Ryan to fix a bad flame job on his beloved police cruiser that's been sitting in the shop for years. A customer asks Shannon to restore his 1979 Iron Head Sportster that's more a pile of parts than a bike. Danny and Roli come across a 1974 Nova that would make for a great flip but the owner isn't ready to let her go. Danny and Kevin check out the 1940 Dodge rat rod Horny Mike told them about to see if it's a buy, or a bust. Season 4, Episode 32 - "Dune Buggy Blues"
Danny has found and bought a replacement for his beloved Dune Buggy "Sparkles." As the guys are turning it into the ultimate 70s beach fantasy, Mike convinces Ryan to take it for a quick joy ride that ends anything but joyful. Also, Danny visits a collection with a patriotic 1962 Corvette he falls in love with. Season 4, Episode 31 - "Ready, Set, Van Gogh!" Ryan is challenged to paint a Harley Trike in the spirit of Van Gogh's "Starry Night," and Kevin finds a car that could be one the most valuable ones Danny has ever seen--if it's an original. Season 4, Episode 30 - "Danny's Dream, Kevin's Nightmare"
Danny has wanted a Plymouth Roadrunner ever since a couple of car nuts pulled him over a few years ago, and bought his Sebring on the spot. He's finally found one and he's doing it up exactly as he wants to. Meanwhile, Horny Mike takes on a side project that is as scary as it is silly. Season 4, Episode 29 - "Baggers Can't Be Choosers"
A customer wants to trick out his 2004 Harley Davidson Road Glide, but both Shannon and Ryan aren't sure they can do everything he wants. A fellow collector drops by dangling a rare 1970 Lincoln Mark III in front of Danny who can't wait to take her for a spin. Meanwhile Horny Mike wants to prove to Danny he can spot a good flip but instead gets sidetracked by a 1930 Ford rat rod. Season 4, Episode 28 - "You Never Forget Your First Z28, Part 2"
Danny's battle with nightmare Z28 continues as he puts it though endless fabrication to bring it back to life. While it's being revived, Danny takes a break to revisit Steve Barton's world class car collection, and see if he can convince him to sell a gem or two. When the client comes to pick up his Z28, Danny will finally learn if it was worth all the trouble. Season 4, Episode 27 - "You Never Forget Your First Z28, Part 1"
This two-part episode starts with a client asking Danny to find and build a 1979 Camaro Z28, to commemorate the first car he ever owned. After they find one online, they soon learn that the car is not in nearly as good of a condition as they thought, and the project turns into a nightmare. While Danny figures out what to do, another client arrives and asks Ryan to trick out four high end computer towers--in three days. Season 4, Episode 26 - "Firebird Fever"
"Engine Whisperer" Doc has a cool '67 Firebird he's been working on. While he's a mechanical maestro under the hood, his paint skills are lacking so he enlists Ryan to make it look as mean as it will run. Meanwhile, Danny checks out a one-of-a-kind local car collection, including a lightning fast Shelby Mustang and a legendary 1950 Mercury known as "Black Magic." Season 4, Episode 25 - "Special Projects"
Get creative with the Count's Kustoms crew and rediscover some of the most unique projects they've ever taken on: a 1980 Lavey Craft speed boat painted to match the owner's 1935 Chevy, a customized, one of a kind Can-Am Spider, a commemorative go-kart fire truck, a vintage FMC motor home and a severely damaged Lincoln Mark V restored to its former glory. Season 5, Episode 25 - "Special Projects"
Season 4, Episode 24 - "Down By the Riviera"
Legendary rocker George Lynch from the metal band Dokken stops by with his very cool 1965 Buick Riviera. He gives Danny free rein to put the Count's Kustoms rock and roll touch on it. Will Danny be able to please the man who is as passionate about cars, as he is music? Also, after years of having the wrong business info/ graphics on his detailing van, Roli decides to do something about it, and teams up with Horny Mike to get a custom wrap job done. Season 5, Episode 24 - "Down By The Riviera"
Season 5, Episode 23 - "Pullovers"
Take to the streets with the Count's Kustoms crew and revisit some of the best pullovers in the history of Counting Cars: Danny's very first pullover involving a '39 Chevy, a run-in with the law over a '68 Cadillac Limo and a VW Thing that catches Rick Harrison's eye. Later, the tables turn on Danny when he gets pulled over while driving his '73 Plymouth Sebring. Season 4, Episode 23 - "Pullovers"
Season 5, Episode 22 - "Fast and Furry-ous"
Danny scores a pimp-tastic 1967 Impala, but when it's time to hand over the keys to an important client Danny doesn't think he can let her go. Meanwhile Roli does the unthinkable and puts the shop's top project in jeopardy. Danny steps back in time when an old friend shows him a 1914 Ford that's headed to the Smithsonian. Danny and Ryan think they've seen a ghost when they spot a Meyers Manx Dune buggy for sale that looks a lot like their old favorite Sparkles. Season 4, Episode 22 - "Fast and Furry-ous"
Season 5, Episode 21 - "Craziest Rides"
Get wild with Danny and the Count's Kustoms crew and revisit some of the craziest rides ever featured on Counting Cars: a twin-engine Model T hot-rod decked out with four superchargers, an insanely tricked out '73 Buick Riviera, Horny Mike's bus transformed into a giant green monster, a pimped out '71 Cadillac Superfly and an insane one-of-a-kind rat rod that causes Danny to lose his mind. Season 4, Episode 21 - "Craziest Rides"
Season 4, Episode 20 - "Fighting Ford, Part 2"
The shop has its hands full restoring a 1942 Ford truck that needed a lot of TLC and a special touch for the owner's wife. Danny and Ryan check out a badass 1929 Ford Roadster while Gary pulls one over on Mike in the paint shop. Danny comes across a Corvette and Firebird that might be for sale. Season 5, Episode 20 - "Fighting Ford, Part 2"
Season 4, Episode 19 - "Fighting Ford, Part 1"
Danny has a customer who wants to restore a 1942 Ford truck that saw some action in WWII. But when Danny takes in the project he quickly learns it'll need a lot more love than he thought. Roli and Ryan check out a '71 Duster while Danny goes out to look for a quick flip and scores a 1974 Bronco that isn't all he thought it would be. Season 5, Episode 19 - "Fighting Ford, Part 1"
Season 4, Episode 18 - "Black, White and Hotrod All Over"
Danny and the boys meet with a customer who wants a wicked paint job to match his wicked 1959 Anglia dragster. Meanwhile, Shannon and Ryan are building a custom Harley Davidson bagger for a client using a repurposed police bike. Shannon is tired of being dogged by Mike and Roli so he sends them to the dogs. Literally. Season 4, Episode 17 - "A Legend on Two Wheels"
When Danny is asked to create a commemorative bike that honors music legend Les Paul he has to pull out all the stops, and hopes his team can get it done in 30 days. Horny Mike wants to impress Danny and looks at a 1940 Dodge that's for sale. Danny and Kevin investigate a 1964 Galaxie that has Danny wanting to buy it. Season 4, Episode 16 - "Bucks & Broncos (2)"
Danny has a customer all lined up to buy his 1967 Ford Bronco he's restoring, but Ryan's mistake has set the project way back. Meanwhile, Mike and Roli settle a score at a gun range with Shannon keeping the peace. Danny stops to check out a 1980 Fire Truck that was a first responder at the tragic Las Vegas MGM fire and a 1929 Ford has Danny asking Mike to chase it down. Season 4, Episode 15 - "Bucks & Broncos (1)"
Danny is inspired to take back on an old project, a 1967 Ford Bronco that he's already sunk a lot of time and money into but to make any profit, the shop will have to turn it around quickly. Meanwhile, a customer brings in a 1950 Harley Davidson he was restored stock, but will Ryan's paint additions turn him off? Danny gets a chance to go for a spin in a 1966 Corvette Sting Ray and later lucks out and comes across a 1950 Ford 2-Door. Season 4, Episode 14 - "The Count of Monte Carlo"
Danny must give up his prized 1972 Monte Carlo for one of his biggest clients, and is counting on his team to get the job done in one week. Meanwhile Ryan and Mike go for the ride of their lives in a 1965 Fastback Mustang. Danny sneaks a peek at a1948 Olds that looks like it needs a lot of love that he's willing to give but only if it's a good deal. Season 4, Episode 13 - "Stude-licious"
Shannon turns to the shop for help when he takes on restoring a 1962 Karmann Ghia as an anniversary present for his wife. With the tables are turned, Shannon quickly learns that the customer isn't always right. Meanwhile, Danny gets the invitation of a lifetime to check out a legendary personal car collection he's only heard about and comes face to face with a rare El Camino fused with an SSR and the mythical Frankenstude. Season 4, Episode 12 - "Don't Tell Danny"
Mike buys a Smart car and wants to trick it out at the shop, but Kevin warns that Danny hates new cars and can't find out about it until it's done. Danny and Kevin go for a spin in Kevin's new Caddy and come across a 1939 Ford. Danny's pal Shane wants to show Danny his new 1955 Chevy and a special project that will take Danny back to when he first got into cars. Season 4, Episode 11 - "Burning Out"
Danny has big retro plans for a 1972 Cutlass he hopes to flip, and is counting on his fab team to do her right. Roli seeks the help of the guys to learn to do a burn-out. Danny checks out a 1971 Torino whose owner can't seem to put a price on it. Season 4, Episode 10 - "It Hurst So Good"
Season 4, Episode 9 - "The Return of the Big Twin"
Season 4, Episode 8 - "Willys for Warriors"
Season 4, Episode 7 - "Road Runner Redemption"
Season 4, Episode 6 - "The King and the Count"
Season 4, Episode 5 - "I Want My Caddy Back"
Season 4, Episode 4 - "The Full Monte"
Season 4, Episode 3 - "Trail Blazer"
Season 4, Episode 2 - "Count's Car Show"
Season 4, Episode 1 - "Mo' Parts Mo' Problems"
Season 3, Episode 26 - "Employee of the Year"
Season 3, Episode 25 - "Blackjack Bike"
Season 3, Episode 24 - "The Great Car Hunt"
Season 3, Episode 23 - "Van-Tastic"
Season 3, Episode 22 - "Count's Calendar"
Season 3, Episode 21 - "Charger Surprise"
Season 3, Episode 20 - "Chevys and Shelbys"
Season 3, Episode 19 - "Sharon Rides Again"
Season 3, Episode 18 - "Hog Wild"
Season 3, Episode 17 - "Mustang Memories"
Season 3, Episode 16 - "Danny Takes the Heat"
Season 3, Episode 15 - "Heavy Metal"
Season 3, Episode 14 - "Power and Glory"
Season 3, Episode 13 - "Major League Muscle"
Season 3, Episode 12 - "Rocked and Loaded"
Season 3, Episode 11 - "Mercury Rising"
Season 3, Episode 10 - "Horseplay"
Season 3, Episode 9 - "Get Your Kicks"
Season 3, Episode 8 - "GT Oh My My"
Season 3, Episode 7 - "Pimpmobile"
Season 3, Episode 6 - "Roadrunner Recon"
Season 3, Episode 5 - "Quadzilla"
Season 3, Episode 4 - "Pimp My Bus"
Season 3, Episode 3 - "School of Rick"
Season 3, Episode 2 - "Ghost Rider"
Season 3, Episode 1 - "Electric Ride"
Season 2, Episode 26 - "Van Haulin"
Danny helps Shannon restore an old VW van and later finds a `69 Ford Bronco for a single mom who wants to revisit her youth with her son. Season 2, Episode 25 - "The Car Hoarder"
Danny can't stop buying cars. Soon after striking a deal on Gordon's '73 Mustang, he finds an enormous FMC Motorhome, and then ends up in a heated roadside bidding war with Rick Harrison over an extremely rare "thing." Season 2, Episode 24 - "Special Delivery"
Season 2, Episode 23 - "Tour de Pants"
Season 2, Episode 22 - "Zombie Truck"
Season 2, Episode 21 - "Haunted Hog"
Season 2, Episode 20 - "The Horn Ultimatum"
Season 2, Episode 19 - "Floodpocalypse Now"
Season 2, Episode 18 - "The Marleymobile"
Season 2, Episode 17 - "One Love, One Car"
Season 2, Episode 28 - "Change of Heart"
Season 2, Episode 16 - "Super Nova"
Season 2, Episode 15 - "Change of Heart"
Season 2, Episode 14 - "Psychedelic Cycle"
Season 2, Episode 13 - "Day of Judgment"
Season 2, Episode 12 - "Not So Pretty in Pink"
Season 2, Episode 11 - "Chumlee's Challenge"
Season 2, Episode 10 - "Count's Cryptonite"
Season 2, Episode 9 - "Muscle Memory"
Season 2, Episode 8 - "To Die For"
Season 2, Episode 7 - "Old School"
Season 2, Episode 6 - "Rockabilly Roadster"
Season 2, Episode 5 - "Dream On"
Season 2, Episode 4 - "Really Sweet 16"
Season 2, Episode 3 - "Soap Box"
Season 2, Episode 2 - "Size Matters"
Season 2, Episode 1 - "You Talkin' to Me?" Season 1, Episode 13 - "Searching for Soul"
Season 1, Episode 12 - "Framed"
Season 1, Episode 11 - "Ultimate Challenge"
Season 1, Episode 10 - "Maxed Out"
Season 1, Episode 9 - "Politically Correct"
Season 1, Episode 8 - "Boiling Point"
Season 1, Episode 7 - "Satanic Mechanic"
Season 1, Episode 6 - "Deep Trouble"
Season 1, Episode 5 - "Back in the Wind"
Season 1, Episode 4 - "Buyer's Remorse"
Season 1, Episode 3 - "G-T-Whoa!" Season 1, Episode 2 - "Buggin' Out"
Season 1, Episode 1 - "McQueen for a Day"